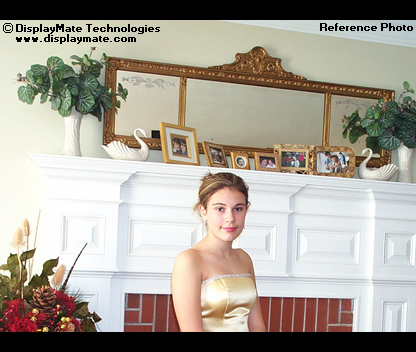 Copyright © 1990-2006 by DisplayMate Technologies Corporation. All Rights Reserved. size (View Menu - Text Size) and margins (File Menu - Page Setup). The smart phones are versatile devices, but they lack some of the features of the players in Part I. All of the players have large hard drives and TV Out that can display photos and videos on a TV. These smart phones don’t have either, but in addition to USB for downloading content, they have flash memory cards, cameras, WiFi, and the phone network, which can deliver photos and videos via web browser, Email, messaging, and streaming. Table 1 lists the most important display specifications for the four phones, arranged by screen size. While the BlackBerry doesn’t have a reputation as a multimedia device, it actually delivers excellent picture quality. One very useful enhancement program for the BlackBerry that we used extensively was Ascendo Photos, which allows photos (or any jpg, bmp, gif images) to be transferred to the phone directly from a PC via USB, and then shown with its own viewer. Otherwise, content on the BlackBerry can only be downloaded via the phone network. Don’t be turned off by the relatively low resolutions of these phones, because it is the pixel density, or Dots Per Inch, DPI, that determines how sharp their images appear, and these are relatively high DPIs. For reference, a 19 inch LCD monitor has a DPI of 86. The number of Screen Colors that a display can produce is frequently misinterpreted as an indication of its color gamut, the range of colors that it can produce. It has nothing to do with the gamut, but rather specifies the number of possible intensity levels for each of the red, green and blue primary colors, which can vary from 32 to 256 levels. Before we can evaluate the picture quality of the phones we need to measure the performance of their LCD panels for Brightness, Contrast, and Viewing Angles. The results shown in Table 2 were made with a laboratory spectroradiometer. See How We Test for technical details and explanations of the measurements. The results are color coded based on the relative performance of all 11 players, phones and game consoles tested for this 3-part series. Green means excellent or significantly better than the other units; red means poor or significantly worse than the other units; and yellow means mediocre performance. The color coding makes it easy to see trends among all of the units. Peak Brightness is very important in bright ambient light viewing conditions (the brighter the better) but is not important for low ambient light viewing. The Nokia N80 and BlackBerry 8700 have light sensors that can automatically dim the screen in low light to help conserve battery power. For these measurements we set up all of the phones so they produced their maximum brightness. The BlackBerry has a special high brightness mode that can be temporarily enabled by clicking its power button. In this mode it was by far the brightest device we tested. The table lists values for both modes. Black Level Brightness is the residual dark glow that the screen (and each pixel) gives off when it is supposed to be producing true black. It is distracting and also washes out both the contrast and color saturation of the dark portions of the image. The Contrast Ratio tells you the range of brightness that the display is capable of producing. The larger the better, but it’s only relevant for low ambient light viewing conditions due to reflections off the screen (next). The Nokia N80 and Palm Treo 700p have Transflective LCD screens that work under both transmission and reflection. Most LCDs are only illuminated by their backlight via transmission through the LCD, but Transflective LCDs can also reflect sunlight within the screen to improve their brightness and readability outdoors. Unfortunately, Transflective screens have higher Black Levels and lower Contrast Ratios, so they don’t work as well in low ambient light, which is easy to see from the table. When these phones are used in bright ambient light the screen can’t be made as dark because it reflects a certain percentage of the room light. This washes out the images by reducing contrast and color saturation. We measured the Screen Reflectance, which is the percentage of ambient light reflected by each phone. The lower the better. The Transflective LCD and Touchscreen on the Treo contribute to its high Reflectance. The Contrast Rating for High Ambient Light is a measure of the contrast you’ll see under high ambient lighting conditions. It is simply the Peak Brightness divided by the Screen Reflectance value in the Table. Again, the larger the better. If you frequently watch under bright ambient light conditions then this may be the single most important specification. While the screens on standard LCDs can appear washed out under the high ambient light outdoors, the Transflective screens can be oriented to catch sunlight and deliver higher Contrast Ratings. The brightness, contrast and color saturation that you see on the screen varies significantly with your viewing angle. It has a major impact on image and picture quality. If you’re watching by yourself, the Forward Tilt Viewing angle will vary depending on how you hold the phone. If you’re watching in a group, people to the left and right of the screen will be positioned with a Horizontal Side Viewing angle. Table 2 lists the Contrast Ratio for a 15 degree forward tilt of the screen, which is the largest angle a single viewer is likely to use. Table 2 also lists the Contrast Ratio for Horizontal Side Viewing at ±45 degrees, which is roughly what a person sitting next to the central viewer will see. These Contrast values provide a good measure of how the viewing experience varies with angle. The low ratings for Side Viewing indicate that all of the phones except the BlackBerry are limited to a single viewer at a time. An LCD screen with low ratings in Table 2 can still wind up looking quite good with the right color scheme because color can be used to enhance the visual contrast in the menu and data screens. That’s how many of these high DPI screens can appear gorgeous. But that technique can’t be used with photos and videos. The image and picture quality of any display depends on its gray scale and saturation of its primary colors. The gray scale describes how the brightness of image pixels varies between the black and white extremes and determines the contrast within an image. Too much is just as bad as too little. 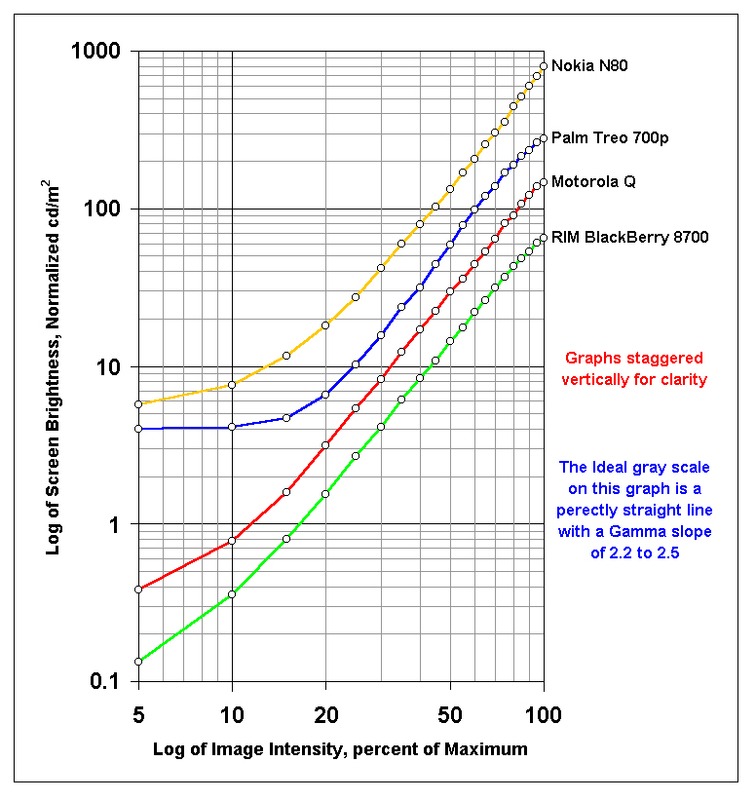 Figure 1 shows the gray scale measured for each phone. See How We Test for details and explanations of the measurements. The differences in gray scales among all eleven devices tested for this series are striking and explain much of the differences in picture quality that we witnessed in the viewing tests. Surprisingly, the phones actually perform better than most of the MP3/PVP players in Part I. These results are summarized in Table 3 by listing the picture contrast, gray scale compression and gamma for each phone. Compression of the gray scale near its maximum intensity makes the picture look overexposed. The lower the better. Gamma specifies the steepness of the gray scale and the amount of Picture Contrast, which by industry standards should have values between 2.2 and 2.5. The high gray scale compression of the Treo together with it low LCD contrast and reduced Color Gamut gives its images a washed out appearance even though it has a high gamma. The colors in all color displays are produced through a combination of three primary colors: red, green and blue. The primaries need to be strong and saturated in order for the displays to be able to reproduce a wide gamut of colors. Too little saturation and the pictures will look flat and pastel-like, too much saturation and the pictures will look gaudy. We measured the primary colors with the spectroradiometer. 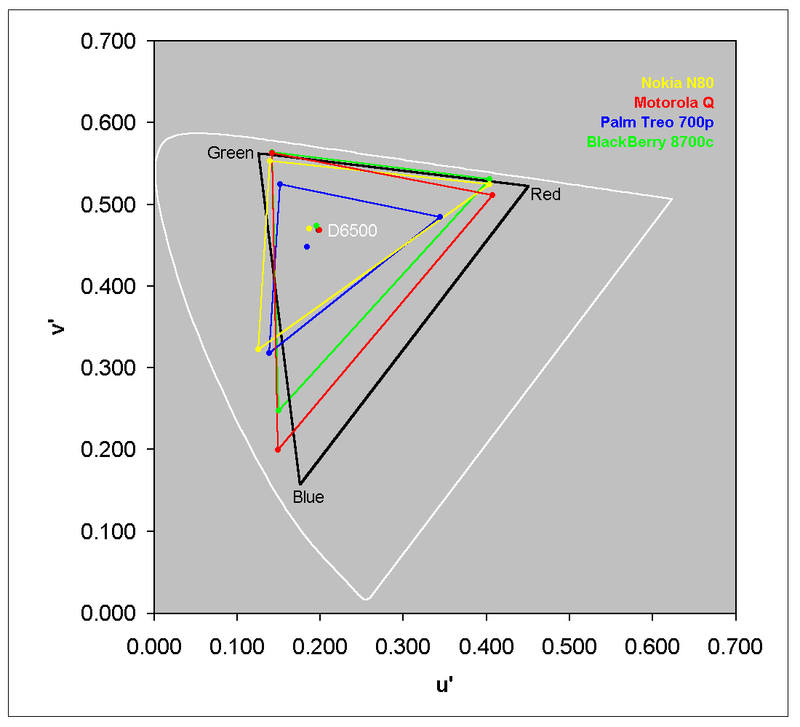 Details are shown in Figure 2 and summarized in Table 3 by comparing the Color Gamut of each phone to that of a standard High Definition TV or sRGB computer monitor. The closer to 100 percent the better. All mobile displays have a reduced color gamut, which can be compensated with proper processing in the device. The Motorola Q and Nintendo DS Lite (Part III) have largest color gamut and the Palm Treo 700p and the Apple iPod (Part I) the smallest. The phones aren’t delivering anywhere near the image and picture quality they are capable of producing. To demonstrate this we’ve produced two sets of photos for each phone: a standard Reference Photo that displays correctly on a calibrated HDTV or computer monitor, and an Optimized Photo that has been mathematically processed based on the lab measurements to improve picture quality. Links for each phone are included in Table 3. Download both and compare them to each other and to full resolution versions of the Reference Photo for HDTVs (1280x720) and LCD computer monitors (1280x1024). Left click the links to view on your current display, right click to download the image files. Note that the Optimized Photos are modified for the specific phones, and will appear to have incorrect gray scales and color on other displays. After downloading the appropriate Reference and Optimized Photos do an A-B comparison by quickly flipping between them. Here is what you should see on a phone, computer monitor or HDTV. A thumbnail of the Reference Photo is pictured at left. Good: Be able to clearly make out ALL of the individual moldings on the fireplace mantle. Very Good: See a natural, smooth and rich facial flesh tone without ANY of the highlights appearing white washed, washed out, or over exposed. 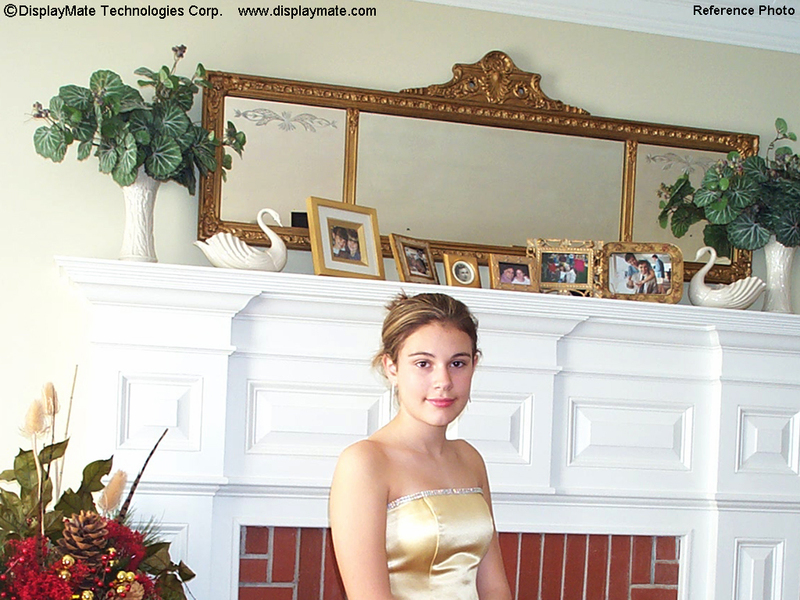 Excellent: See the left edge of the fireplace mantle where it meets the light green wall. All of the phones except the BlackBerry 8700 can play videos. All videos are digitally compressed and the resulting picture quality depends critically on how well this was done when the material was recorded. Within the phone, video images are generated by an extra layer of software that decodes a stored video data stream. After this processing, it is handled in the same way as the photos and other images, so the video picture behaves exactly as in the measurements above. The phones can play video files stored on the device, or live video streams that download via the phone network or WiFi, but at lower resolutions and data rates. In order to view the highest video picture quality that each phone can produce, we used the highest video data rates specified by each manufacturer. The optimum video encoding parameters used for the picture quality tests are listed in Table 3. The end result of this careful preparation is that compression artifacts for all of the phones were small and seldom noticeable on-screen, and therefore were not a factor in the picture quality evaluations. After the extensive lab tests it was time to see how well the units would perform visually with real photos and videos. So, for the Shoot-Out style Viewing Tests, we compared all eleven tested units simultaneously, side-by-side, showing identical content and comparing them to each other and to a carefully calibrated digital HDTV connected to a PC. I used a large selection of challenging photos that we have for evaluating HDTVs. For video picture quality I used a number of movie clips including The Matrix (which has lots of dark content and a subtle green caste that is difficult for displays to reproduce accurately) and Seabiscuit (which has lots of colorful outside scenery and great facial close-ups). Table 4 provides the results. For the grading and rankings I carefully arranged all of the units until they were ordered from best to worst picture quality, left to right. The evaluations are based on ideal viewing conditions with no ambient light and perfect face-on (zero degree) viewing angle. Each display was scored based on how close it came to delivering an ideal picture, so its screen size, brightness, and pixel count are not part of the grade. Looking at photos and videos on all eleven screens at once was an amazing experience. The range and differences in picture quality were staggering. Two smart phones, the Motorola Q and RIM BlackBerry 8700, delivered excellent image and picture quality and outperformed all of the mobile displays except for the high-end Archos 604 and Epson P-4000 players in Part I. While the Palm Treo 700p is a fabulous phone and a pleasure to use, it unfortunately delivers washed out pictures due to low LCD contrast and weak primary colors. Its image quality on menu and data screens, however, is excellent. All of these phones are roughly the same size as the larger format MP3/photo/video players like the Apple iPod and Creative Zen Vision:M (and the upcoming Microsoft Zune). In view of the excellent performance of the phones, it seems likely that many users will not want to carry two similar devices, so the they are likely to cannibalize the viability of large MP3 players in the near future. One major advantage of the MP3 players is the simplicity of their user interface, but with some careful thought, the phone manufacturers should be able to improve the user interfaces and take proper advantage of their versatile keyboards for browsing the audio, photo, and video content. Much of the reduced image and picture quality of the phones is due to sub-optimal processing within each unit. The Optimized Photos (available via links in Table 3) demonstrate the picture quality the units are capable of producing when mathematical corrections based on the lab measurements are applied to the image files. You can download them and see for yourself if you have one of the tested units. The bottom row of Table 4 provides the image and picture quality ratings based on the Optimized images. When viewing them, the differences between phones become relatively small and all of the phones deliver very good to excellent picture quality. Hopefully, the next generation of devices will improve their software/firmware processing and produce this kind of picture quality on their own. In Part III, we’ll examine the image and picture quality of the Nintendo DS Lite and Sony PSP Playstation Portable. Dr. Raymond Soneira is President of DisplayMate Technologies Corporation of Amherst, New Hampshire, which produces video calibration, evaluation, and diagnostic products for consumers, technicians, and manufacturers. See www.displaymate.com. He is a research scientist with a career that spans physics, computer science, and television system design. Dr. Soneira obtained his Ph.D. in Theoretical Physics from Princeton University, spent 5 years as a Long-Term Member of the world famous Institute for Advanced Study in Princeton, another 5 years as a Principal Investigator in the Computer Systems Research Laboratory at AT&T Bell Laboratories, and has also designed, tested, and installed color television broadcast equipment for the CBS Television Network Engineering and Development Department. He has authored over 35 research articles in scientific journals in physics and computer science, including Scientific American. If you have any comments or questions about the article, you can contact him at dtso.info@displaymate.com. 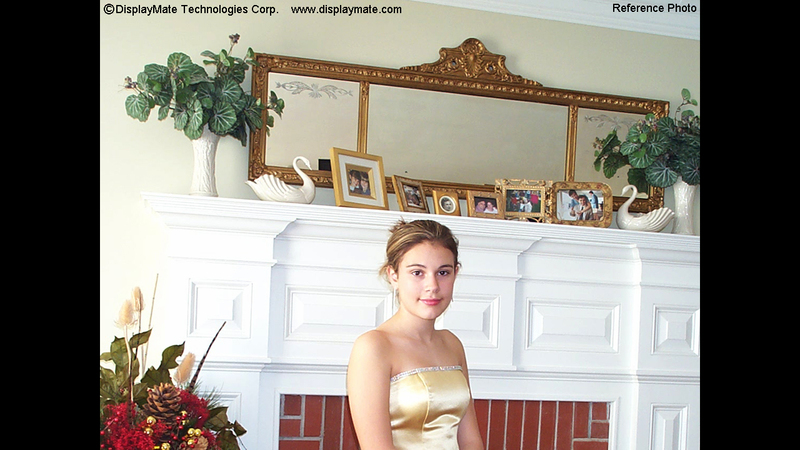 Copyright © 1990-2009 by DisplayMate® Technologies Corporation. All Rights Reserved. Screen Resolution: This site best viewed at a resolution format of 1280x1024 pixels or more. Landscape mode or reduce the font size (View Menu - Text Size) and margins (File Menu - Page Setup).